At the beginning of the game, Xiao Qiao is given seven cards. She picks four of these for her initial hand. The other three are set aside as Fans. These can be used as either peaches or peach gardens. When any tool has more than one target, it does not affect Xiao Qiao. 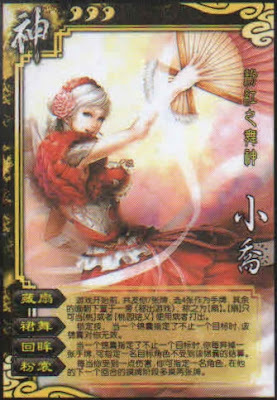 When a tool has more than one target, Xiao Qiao can discard any card to prevent one target from being affected. For every unit of damage Xiao Qiao causes, the person who was damaged draws two extra cards on their next turn. "Hidden Fan" works similarly to God Zhuge Liang's "Seven Stars". Each of the Fans can be used as either a Peach or a Peach Garden. Xiao Qiao can use "Turning Glance" on more than one person for the same tool card. When a player is affected by "Beautiful Gown", they do not draw any additional cards until their next drawing phase. If that player has Starvation placed on them, they will miss out on the additional cards.